great British bake off challenge April 2019: cornish pasties! For our April 2019 Great British Bake Off Challenge we thought we’d tackle something savory, since February and March brought you sweet treats. For any fellow followers of GBBO, it probably won’t come as a surprise that there are rules about Cornish pasties. 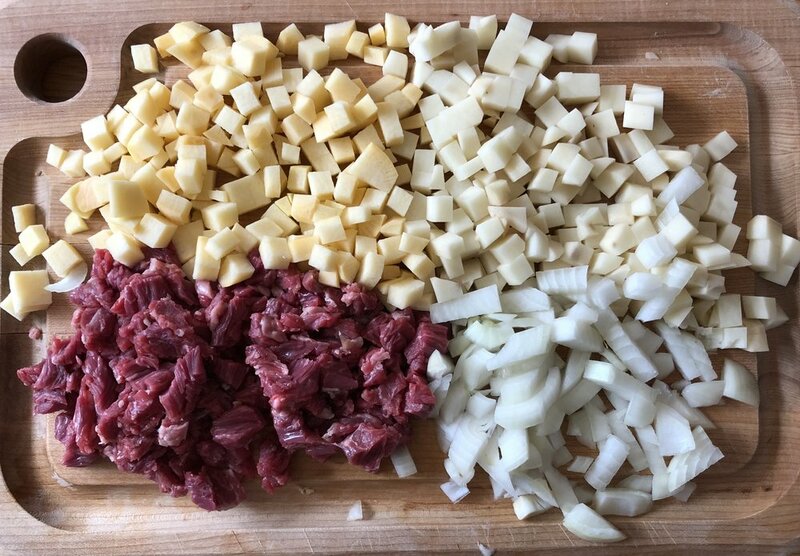 For one thing, they must contain “swede,” otherwise known as rutabaga, potato, onion, and beef. Salt and pepper. That’s it. The filing must go into the pastry raw…and come out cooked. They should be shaped like semicircles and there should be, traditionally, 20-21 crimps to seal the edge. The dough, for a classic pasty, needs to be sturdy. That’s because these served as complete portable meals for the miners of Cornwall. Just grab n’ go! The way you work this dough (and boy, do you work it) seems a bit backwards if you are used to recipes urging you to use a light hand, not to overwork the dough, etc. etc. Those urgings are all fine and well when you are going for a tender crust, but that’s not the endgame here. Remember, Cornish pasties served as portable meals for miners, so the dough had to withstand a bit of rough treatment. Finally, the pastries in Paul Hollywood’s recipe are also HUGE! (See feature photo above.) He has you roll out the dough into 10-inch circles. After I made two of that size, I decided to adapt the recipe. A 10-inch pastry might be an appropriate meal for a miner laboring away all day, but I have no cause to need a 10-inch pastry for dinner. Half that size seemed about right. I almost forgot. how did they taste? The pastry reminded me a little bit of Sophie’s knish, but not quite as good. It is sturdy, a good container for a soft filling, and besides that not particularly remarkable. The filling is good…I loved the flavor the rutabaga adds, and how soft and juicy the meat and veggies cook up. Overall, these Cornish Pasties are classic, simple, rustic and satisfying. One of my gripes with Paul Hollywood’s recipe was the lack of specificity for some ingredients, like seasoning & butter (“knob of butter,” although charming, isn’t super helpful). I think with some guidance—which we offer from our own experience below!—these would go from “pretty good” to something more spectacular. Make the pastry dough. In a mixing bowl, stir together flour and salt. Add the cold, cubed butter and cut with a pastry cutter or use your fingers to rub into the flour until the texture is like coarse sand. Add water and stir until it forms a shaggy dough. Dump the contents out onto a clean surface (no need to flour or grease) and begin kneading, stretching the dough by pushing down with the heel of your palm and pushing/smearing it away from you. Gather dough together again into a ball and repeat until you have a smooth, shiny dough, about 5-6 minutes. Don’t be afraid to be rough! 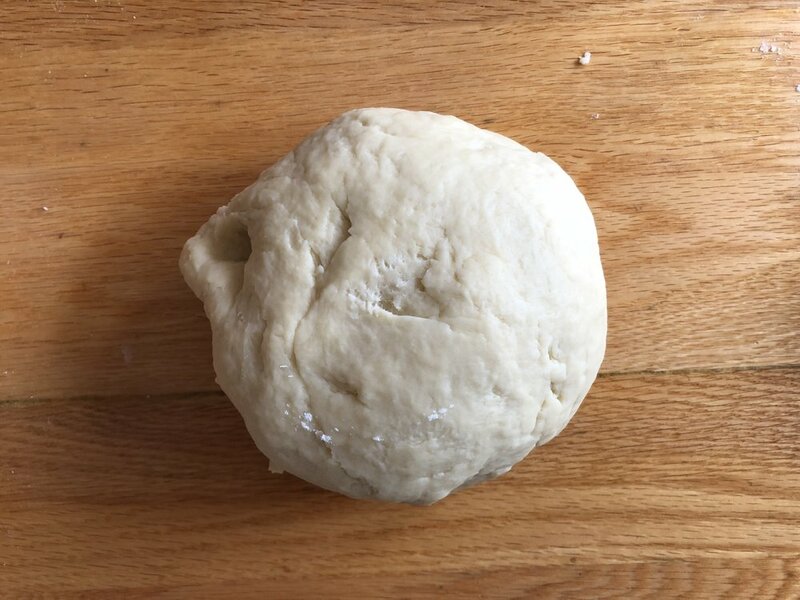 When the dough is smooth, form it into a ball, wrap with plastic wrap, and place in the fridge to allow the gluten to relax, about 30-60 minutes. Preheat the oven to 325 degrees. Line with parchment paper or lightly grease two baking sheets. Place a scoop of filling on the bottom half of the pastry round. That’s about one heaping cup of filling for large pastries, and half that amount for the smaller pastries. Top the filling with a “knob” of butter (! ), which is somewhere between 1/2-1 tablespoon per small pastry (so double that for a big one). I say, the more, the better! Place the filled and crimped pastry on the prepared baking sheet, and brush with the egg yolk beaten with a pinch of salt. Repeat the rolling/filling/sealing process with remaining pieces of dough. Bake pastries. Bake the Cornish Pasties in the oven at 325 degrees for 45 minutes, remembering to rotate the pans halfway through to ensure even baking and coloring. Check on the pastries at the 35-minute mark — if they aren’t taking on a nice golden color, then crank up the heat to 350 degrees for the remaining 10 minutes of cooking time. Serving suggestions: we ate ours like we eat our knish—with mustard and sour cream for dipping—although I’m not sure that’s particularly authentic! Although a “complete” meal in themselves, these pasties would be complimented well by a side of greens. pastry dough: Paul Hollywood’s recipe calls for a combination of butter and suet/vegetable shortening. I prefer all-butter doughs and so adjusted the recipe accordingly. Likewise, the original recipe doesn’t specify cold butter, and the first step is simply to “combine” ingredients. In my recipe, I opted for the classic pastry approach, cutting cold butter into the dry ingredients. beef steak: The original recipe calls for a cut of good-quality beef skirt, rump, or braising steak. I found flap steak at my local Whole Foods at a good price, and it worked very well. Also, I wanted to be precise so I cut off the extra 3 oz from my 15-oz steak, because the recipe only calls for 12 oz. We found the steak to be on the skimpy side, so next time around I will throw it all in! potato: in one of Paul’s recipes he calls for waxy potatoes, and in another he calls for floury potatoes — so I don’t think it matters particularly which you use. I went with a large baking potato. butter in filling: Paul’s GBBO recipe calls for “knobs” of butter to be placed on top of the filling before folding the pastry over. Not particularly precise! I went with roughly 1 tablespoon per large 10-inch pastry (so 1/2 for each half-sized pastry), and it seemed about right…but next time I think I would add a little more, because that is the only “sauce” the filling gets. cooking time: I forgot to check my pastries at the 35-minute mark, so by the time the timer rang and they had been cooking for 45 minutes, they still didn’t have a good golden color. I cranked up the heat and cooked them for an additional 10 minutes…they gained a good color and the filling didn’t suffer. Adapted from Paul Hollywood’s GBBO recipe, as it appears on BBC.com.